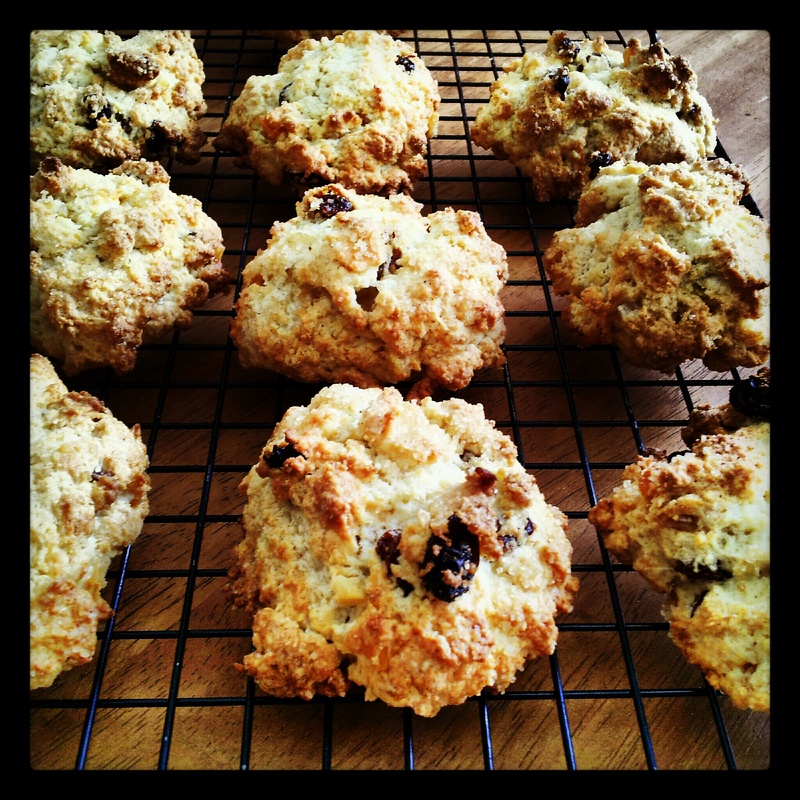 This tasty offering is a spiced fruity drop scone that is baked on a griddle pan. You can whip up a batch in no time and enjoy them hot from the pan slathered with butter and jam or sprinkled with sugar. Tip the flour, sugar, mixed spice and a pinch of salt into a bowl. Then, with your fingers, rub in the butter until crumbly. Mix in the currants and mixed peel. Work the egg into the mixture until you have soft dough, adding a splash of milk if it seems a little dry. It should be the same consistency as shortcrust pastry. Roll out the dough on a lightly floured work surface to the thickness of your little finger. Cut out rounds using a 6cm cutter, re-rolling any trimmings. Grease a flat griddle pan or heavy frying pan with butter and place over a medium heat. Cook the Welsh cakes in batches, for about 3 mins each side, until golden brown, crisp and cooked through. Delicious served warm with butter and jam, or simply sprinkled with caster sugar. Cakes will stay fresh in a tin for 1 week. Bread and butter pudding is a traditional English pudding that goes easy on the wallet and is a fantastic way to use up your old loaves. It is one of my all-time favourites! Bread that is a couple of days old works best for this as it soaks up the lovely eggy custard so you get a crunchy, golden top and a soft, delicate centre. Don’t use pre-sliced bread. It is nowhere near as nice. You’ve been warned. Pre-heat the oven to 180°C/160 fan. You will also need a 2 pint (1.2 litre) enamel baking dish (one of the oblong kind), well buttered. Butter the bread, remove the crusts and cut each slice of buttered bread in half. Now arrange one layer of buttered bread over the base of the baking dish, sprinkle the candied peel and half the currants over, then cover with another layer of the bread slices and the remainder of the currants. Next, in a glass measuring jug, measure out the milk and add the double cream. Stir in the caster sugar and cinnamon (if using) then whisk the eggs, first on their own in a small basin and then into the milk mixture. Pour the whole lot over the bread, sprinkle over some freshly grated nutmeg and demerara sugar then bake in the oven for 40 minutes or until golden. Serve warm with cream, ice-cream or custard. Top tip: To make your pudding boozy, soak the dried fruit in 2 tbsp of brandy, whisky or rum before adding. The liquid will make the fruit really plump and luxurious and infuse your pudding with a subtle boozy, warming flavour. 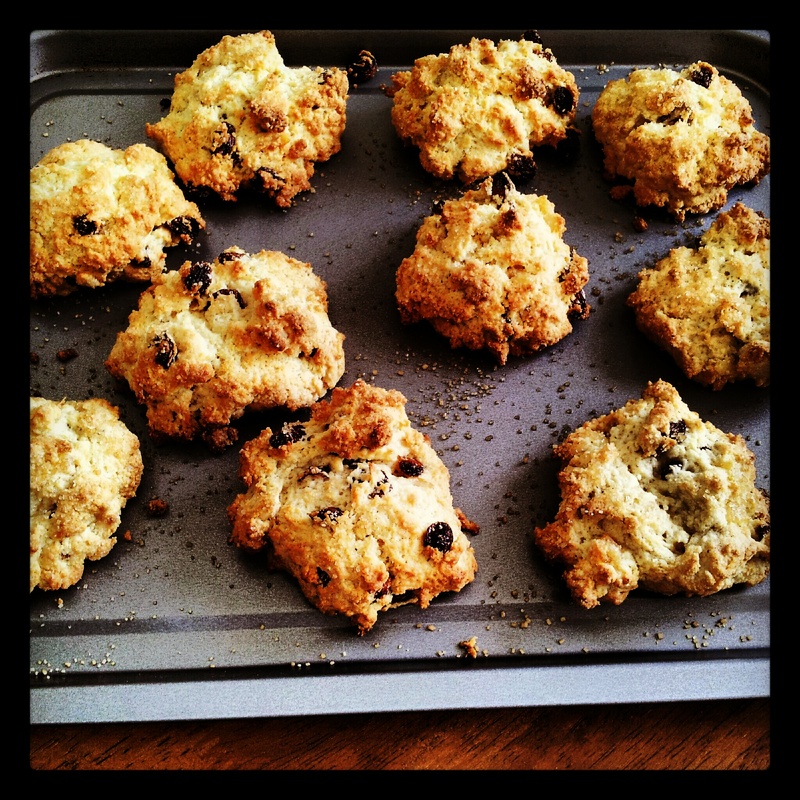 Who doesn’t like moist, crumbly, lightly spiced rock cakes? …Apart from coeliacs. These really are so simple to make and taste absolutely delicious. They are definitely best eaten warm from the oven spread with a little bit of butter and even with some jam. The rocky exterior is crunchy and the inside is fluffy and studded with juicy fruit. For a richer rock cake use the ‘luxury’ type of dried fruit mix, with cherries and apricots as well as raisins, currants, sultanas and chopped candied lemon and orange peel. 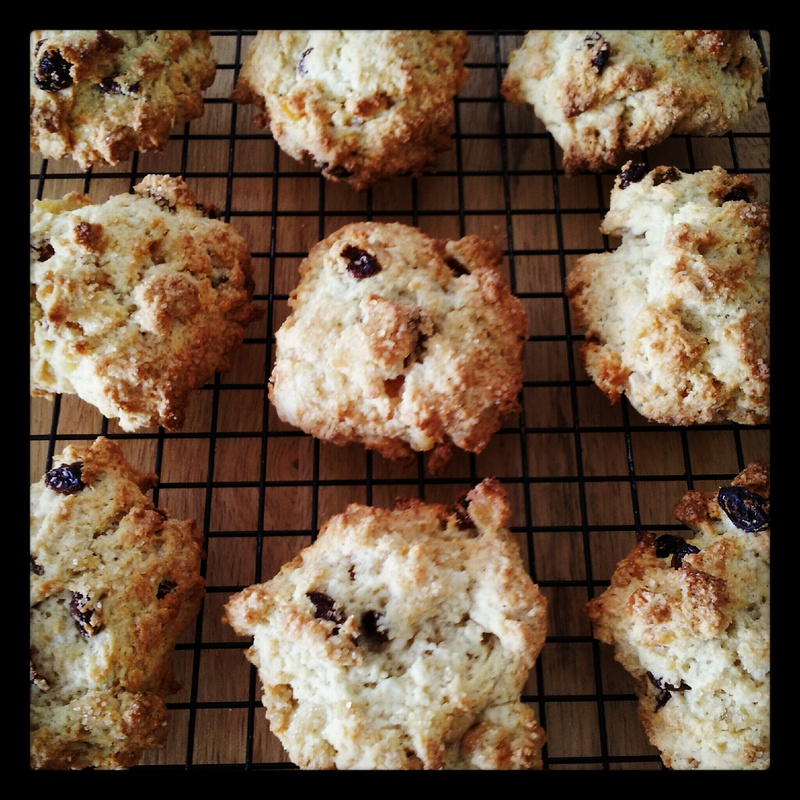 I used 50g sultanas and 50g of chopped mixed peel as that is what I had in my cupboard and they turned out beautifully. Sift the flour and mixed spice and salt into a mixing bowl. Add the diced butter and rub into the flour until the mixture resembles fine crumbs. Stir in the sugar and dried fruit with a wooden spoon. In a separate bowl, lightly beat the egg with the milk until combined, then stir just enough into the fruit mixture to bind to a very firm, stiff dough – it’s important that the dough holds its shape, but if there are dry crumbs at the bottom of the bowl and the dough won’t stick together, add more milk, a teaspoon at a time. Divide the dough into 10 and spoon on to the prepared baking tray in heaped peaky mounds (to look like rocks), spaced well apart. Sprinkle with the Demerara sugar. Bake in the preheated oven for 12 to 15 minutes, or until the cakes are a good golden brown and firm to the touch. Transfer to a wire rack and leave to cool. Eat warm or at room temperature, the same day.